Design a poster that creates a dialogue between typography and imagery utilizing one, or a combination of the type and image relationships discussed in class (separation, fusion, fragmentation, inversion). Challenge yourself by thinking conceptually and exploring different ways of creating imagery and typography. My posters reflect the two different personalities of Stephen Colbert. I had the opportunity to see him live in New York City one summer, and saw the different between his on-air personality, which was very bubbly, energetic and animated, versus his off-air personality, which was still cheerful and welcoming but much more reserved and modest. Seeing the contrast between these two personalities, I wanted to create a poster series that represented this idea. For my purely typographic poster, I played with overlapping type and having different layers represent different meanings. 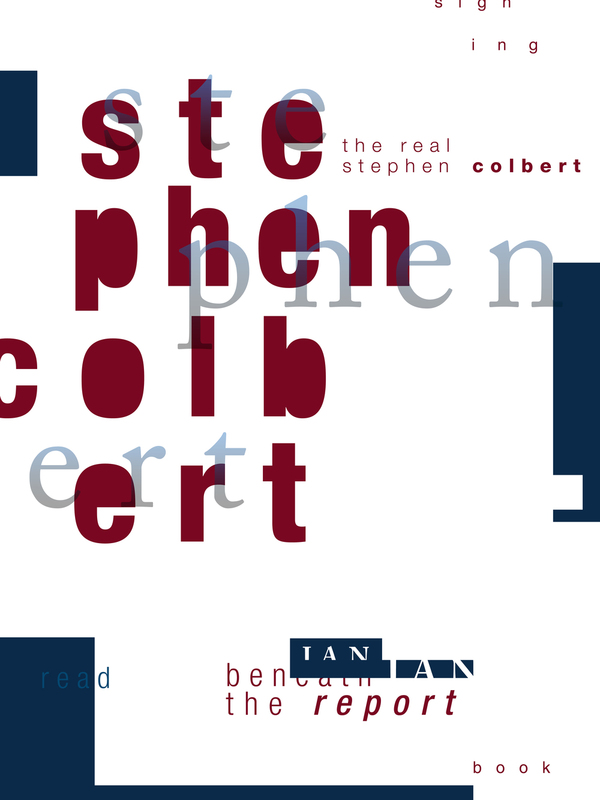 The background layer, which is made of all red, san serif type, represents Colbert's on-air personality, while the foreground, made of all blue, serif type, represents his real-life personality. My message is meant to convey that his on-air personality shines through his real-life personality and hides his true self from the viewers. 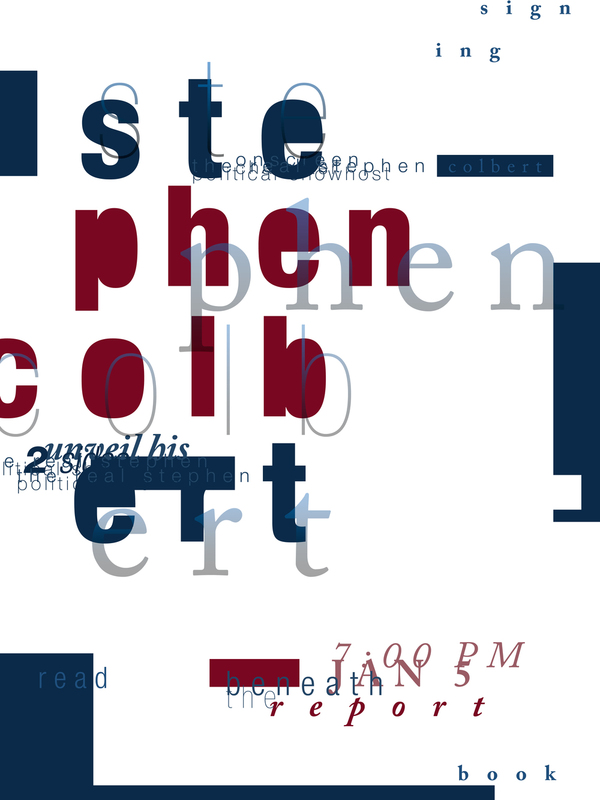 When viewing my poster, you will notice the bold, red letters in the background first, just as you notice and recognize Colbert's on-air character first; however, if you take a closer look you'll realize that his off-air personality is still there, just less identifiable. The blue, serif type represents his more delicate and modest off-air character. For my type and image poster, I used the same overall concept but represented it in a different way. 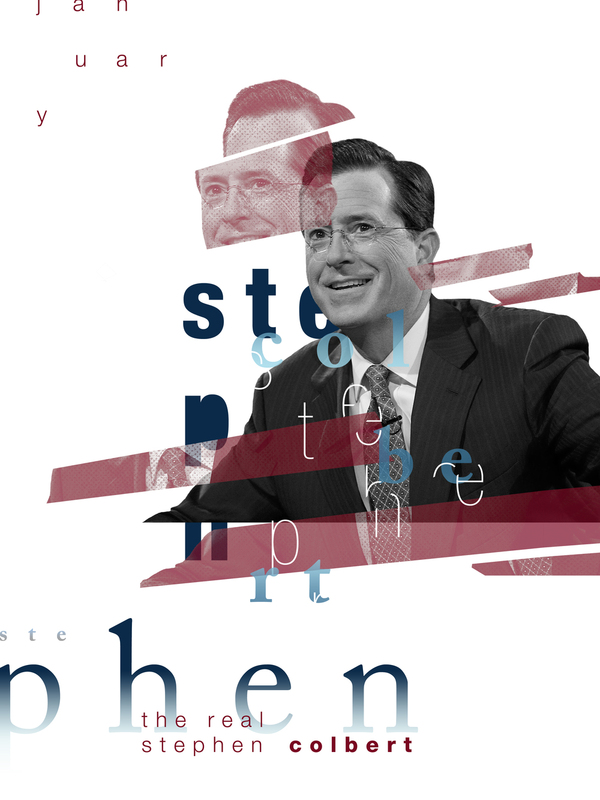 I cut out an image of Colbert, pasted it on the page, created a half-tone effect on the duplicate version, sliced it up and created a glitch effect. This effect represents his two personalities as well, as the red glitches represent his on-air personality while the black and white image underneath represents his stable and humble off-air personality. His on-air character often hides or distracts the viewer from seeing who Colbert really is, and that is what my poster signifies.